Hand painted bunches of flowers decorate this super vintage fan from the 1920s era. 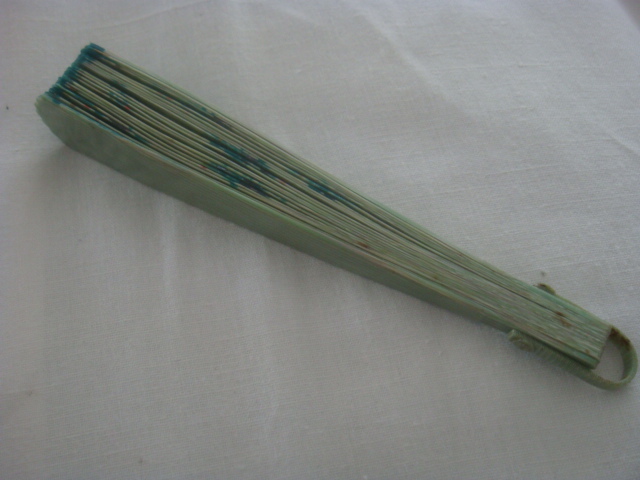 The fan is made of celluloid which is pale green and striped. 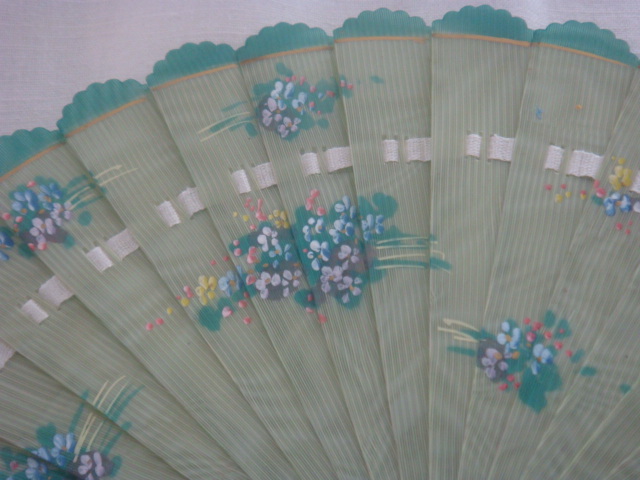 Upon this celluloid fan there are seven bunches of handpainted flowers and leaves in shades of purple, blue, yellow and pink. 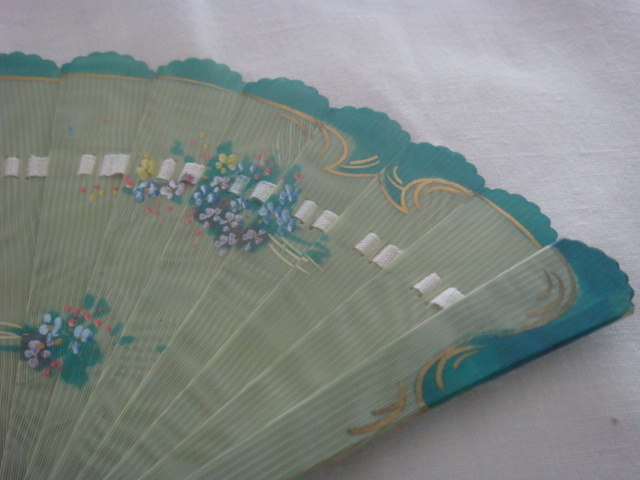 The fan also has a hand finished border of solid green colour with a little applied gold decoration too. The edge of this fan is crimped, it has an ivory cream ribbon threaded through it and it is in Excellent condition. When opened fully this vintage fan measures approximately 11 inches by 6 inches. It has a neat handle, also of celluloid. It would make a super addition to a collection of antique fans or Art Deco era early plastic jewellery and vintage accessories. 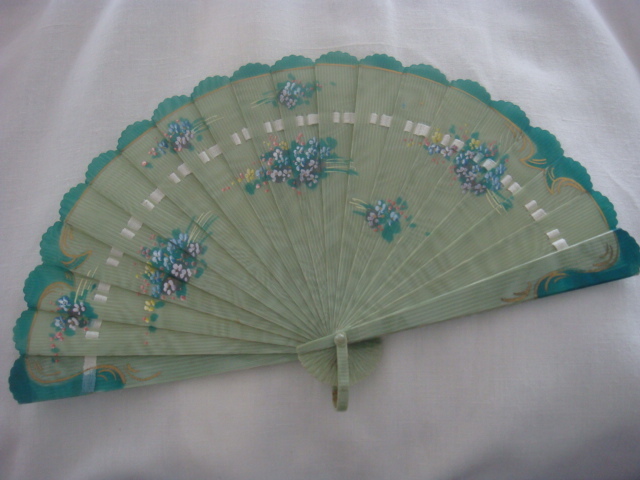 Fans are a fascinating collectable and an important antique and vintage fashion accessory. They have been used from very early times and by the most primitive peoples as cooling devices and for winnowing and activating fires. They have had a role in ceremony and are often objects of great beauty and elegance. 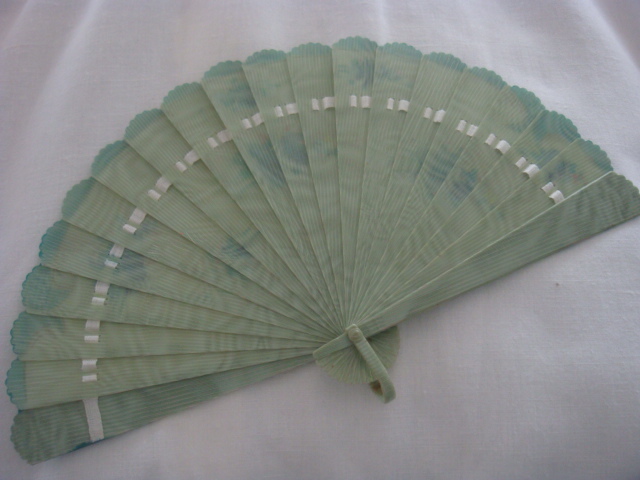 There are some superb examples of fans in many of our museums and the role of the fan has evolved as a courtship device with a secret language and also as an advertising tool - particularly with the paper fans that were used for promoting champagne, night clubs and other things in the art deco 1930s period. I recommend the Shire Publication 'Fans' by Helene Alexander ISBN 0-7478-0402-B for further reading.